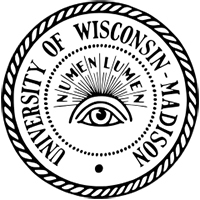 The University of Wisconsin's Department of Physics began in 1868 and now has research groups in areas such as astrophysics; atomic, molecular & optical physics; biophysics; condensed matter physics; cosmology; high energy physics; nuclear physics; and plasma physics. 1868Department of Physics was founded, Madison (Wis.). 1897 – 1901Robert Wood was on faculty. 1928 – 1934John Van Vleck was on faculty. 1930 – 1937Leland Haworth was on faculty. 1934 – 1947Gregory Breit was on faculty. 1935 – 1936Eugene Feenberg was on faculty. 1935 – 1972Raymond Herb was on faculty. 1937 – 1938Eugene Wigner was on faculty. 1941 – 1942Léon Brillouin was on faculty. 1946 – 1997Henry "Heinz" Barschall was on faculty. 1947 – 1964Robert Sachs was on faculty. 1950 – 1953Joaquin "Quin" Luttinger was on faculty. 1951 – 1953Robert Adair was on faculty. 1952 – 1954Willy Haeberli was on faculty. 1954 – 1957Kenneth Watson was on faculty. 1956 – presentWilly Haeberli has been on faculty. 1961 – presentMaurice Webb has been on faculty. 1962 – 1993Donald Kerst was on faculty. 1965 – 2008William Kraushaar was on faculty. 1970 – presentMax Lagally has been on faculty. 1972 – 1978Samuel Aronson was on faculty. 1981 – presentNoah Hershkowitz has been on faculty. 1995 – presentFranz Himpsel has been on faculty. 2001 – presentSusan Coppersmith has been on faculty. Historical information from University of Wisconsin Department of Physics website (http://www.physics.wisc.edu/welcome). Received PhD (1951). Instructor in Physics. Assistant Professor to Professor of Physics; Chair, Department of Physics; Bascom Professor of Physics, Medical Physics, and Nuclear Engineering; and Emeritus Professor of Physics, Medical Physics, and Nuclear Engineering. Professor of Physics and Chair, Department of Physics. Research Associate; Assistant Professor of Physics; Associate Professor of Physics; Professor of Physics; and Professor Emeritus of Physics. Received PhD in Physics (1931). Instructor in Physics. Received BA and PhD in Physics (1935). Research Associate in Physics; Assistant Professor of Physics; Associate Professor to Professor of Physics; and Charles Mendenhall Professor of Physics. Professor to Irving Langmuir Professor of Engineering Physics. Professor of Physics; Scientific Director, Synchrotron Radiation Center; and Ednor M. Rowe Professor of Physics. Professor of Physics; Max Mason Professor of Physics; Chair, Department of Physics; and Professor Emeritus of Physics. Received MS and PhD in Physics (1968). Instructor and Research Associate in Physics; Assistant Professor to Associate Professor; John Bascom Professor of Surface Science and Technology; and Erwin W. Mueller Professor of Physics. Assistant Professor to Associate Professor of Physics. Associate Professor to Professor of Physics. Received AB (1920). Professor of Physics. Received BS (1950), MS (1952), and PhD (1956). Associate Professor of Physics; Professor of Physics; Department Chair; and Emeritus Professor of Physics. Instructor in Physics and Assistant Professor of Physics. Received AB (1909), AM, and PhD in Physics (1914). Received BS (1936) and PhD (1939). Received AM and PhD in Physics (1926). Received MS and PhD in Physics (1964). Received PhD in Physics (1950). Received BA and PhD in Physics (1937). E. M. Terry Professor of Physics and Emeritus Professor of Physics. Received BA (1930) and PhD (1935). Received PhD in Physics (1934). Received BA (1917), AM (1920), and PhD (1922). Received MA (1969) and PhD (1973). Participated in the study of multi-institutional collaborations. E632 collaboration meeting records, 1980-1997. Pages from catalogs listing faculty of University of Wisconsin Physics Department, 1900-1940. Andrew Gemant autobiography, circa 1963. Edson Ray Wolcott autobiography, 1951. Edson Ray Wolcott diplomas, dates unknown. Henry H. Barschall papers, 1942-1974. Henry H. Barschall papers, 1960-1970. Hugo B Wahlin general files, 1932-1960. J. H. Van Vleck: quantum theory and magnetism [sound recording], 2011 March 22. Kenneth L. Cashdollar class notes, 1972-1973. Oral history interview with Albert Edward Whitford, 1977 July 15 and 1978 July 17. Oral history interview with Chun C. Lin, 2008 October 14. Oral history interview with David Abraham Katcher, 1986 April 16. Oral history interview with Eugene Feenberg, 1973 April 13 and 14. Oral history interview with Eugene Paul Wigner, 1966 November 30. Oral history interview with Eugene Paul Wigner, 1984 April 12. Oral history interview with Frederick Seitz, 1981 January 26, 27, March 24 and 1982 March 16. Oral history interview with Gerson Goldhaber, 2005 June 22, 23, 24, 2006 February 27, 28 and March 1. Oral history interview with Harold Warren Lewis, 1986 July 6. Oral history interview with J. H. Van Vleck, 1963 October 2 and 4. Oral history interview with J. H. Van Vleck, 1966 February 28 and 1973 January 19. Oral history interview with Lee A. DuBridge, 1987 March 6. Oral history interview with Paul Rudolph Zilsel, 1988 March 21 and 26. Oral history interview with Raymond Thayer Birge, 1960 May 9. Oral history interview with Robert Serber, 1983 December 19. Oral history interview with Victor Vacquier, 1988 February 17 and 1989 January 24. Oral history interviews. High-Energy Physics. Selected Experiments: SLAC-PEP-006: The MAC Detector at PEP.Oral history interviews, 1990-1991. Oral history interviews. High-Energy Physics. Selected Experiments: SLAC-SP-007B: Search for Asymmetry in E+ E- -- MU+ MU- due to a Weak Neutral Current and FNAL-E-310: Further Study of High Energy Neutrino Interactions at NAL, 1990-1991. P. Gerald Kruger letters to Erika Wackenroder Kruger, Germany: 1939-1940. Ralph P. Winch autobiographical notes and comments, 1964. Low temperature detectors : Ninth International Workshop on Low Temperature Detectors : Madison, Wisconsin, 22-27 July 2001 : LTD-9 / editors, F. Scott Porter ... [et al.] ; sponsoring organizations, University of Wisconsin-Madison, NASA/Goddard Space Flight Center.